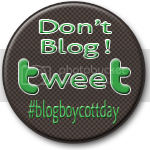 It's a bloggy boycott day. If you tweet, find me at @amyeatlivelaugh! I'm sure I'll be tweeting up a storm. Not just taking a day off. There is important tweeting to be done!